Hunter, Spyro, Cynder and Sparx approach the dragon city but find it besieged by Malefor's army. A number of moles are trapped in a burning building and shout for help. The burning building has a health bar at the bottom of the screen, but this can be ignored, as the building deteriorates based and how far you are at putting it out and not on any timer. This makes it possible to fail this task. First things first, turn right around away from the burning building. Leave the square through the exit in the opposite corner from the fire. Follow the path round until it reaches a dead end. There will be a switch here and you will receive "Fill the Pool with Water" as an objective. Whilst turning the wheel, you will be ambushed by a small group of enemies, mostly grublins and orcs including a new form equipped with a crossbow. Kill them all and finish turning the wheel to fill the pool. The building will explode and its health bar will decrease. Turn around and go back along to the building. Once you reach the square that holds it, keep going and go through the archway straight ahead of you. This leads to another square that has a gate in it. Use the lever to open the gate and unlock the buckets. The building will explode again and the flames become even higher. Go and pick up a bucket. Unfortunately this will cause more enemies to pop up, but they can be ignored. Take the bucket back to the pool that you filled in the main square and fill it with water. Fly over the burning building with the bucket to drop it and partially extinguish the flames. It takes a total of three bucket-loads of water to fully put out the fire, so it takes two or three journeys to finally put them out. If the dragon with the bucket is hit, they will drop the bucket and you will have to go back for another one. The second shadow door containing the armour chest. To beat them, use the shadow breath to travel under the section at the bottom. After the cutscene you will not receive an objective until you leave this area and move up to the ramparts. However, first there is the small matter of exploring this area. In the main square this is a shadow door with a red upgrade crystal behind it. To get to it, use Cynder's shadow breath to go under it and pop up on the other side to get the crystal. There is a switch at the back to open the door, but there is no need to have Spyro in here so it is pointless pulling it. Next to this is an area where the pillars supporting the building are missing. Jump up to what is left hanging and it has climbing zones on it. Climb them and you will find another shadow door. This one contains an armour chest, but to open it you need both dragons so pull the lever to open the door. In the chest is Cynder's offensive tailpiece which increases her attack speed. 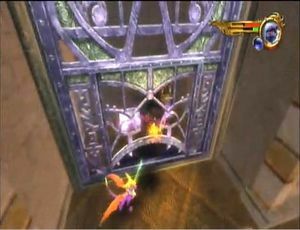 There is a brazier just outside this door; use Spyro's fire breath to light it. When three of these are lit the large metal door will open, this one lights the middle fire. Carry on across the rooftops to find a spirit gem on the roof of the building you just saved from the fire. There is a green upgrade crystal in an alcove on the way to the area with the wheel that filled the pool. Carry on and climb the climbing zones to find a wind horn, then use Cynder's wind breath make it lower a second brazier on the other side of the square. This lights the left fire above the door. Go the area that has the bucket house in it. Go up the stairs to find a spirit gem. Some grublins will burst out of the floor, but again they are skippable if you don't want to fight. At the top of the stairs is a save point and the third brazier, the one on the right. The door will now open and a red crystal upgrade can be picked up and there is also a spirit gem next to it. Go through the door at the top of the stairs and pull the lever, which closes the door behind you but opens the one ahead. The objective here is simple, defend the catapult against the horde of attacking grublins. The catapults health bar is displayed at the bottom of the screen. When it is down to under half health you should probably go and repair it at the flaming hole beside it. This works like any other switch or lever, just hammer the appropriate button until the health bar is refilled. When enough of the enemies are dispatched the artillery mole will pop up and ask you to reload the catapult. To do this head backward from the catapult into the camera and pull the lever back there. After this is completed a siege tower appears on the left hand side of the city wall and will begin firing at the catapult. Run towards it and a load of enemies will pop out, a collection of grublins and orcs. There is an infinite number of these enemies whilst the siege tower is still up so killing them all is not a priority. Instead go to the front of the tower and attack the mana-sapping dark gem. When this is destroyed the tower explodes. Keep an eye on the catapult's health as it is easy to get carried away destroying the tower and forget about it. The mole will then get knocked out of the catapult and land on the wall and you need to get him back. The mole will not move when there are enemies nearby, he cowers in fear. To get him to move again kill all the enemies. There are four groups of enemies that interrupt the moles return the catapult and the catapult is still getting hit. When the mole is back in the catapult it will need to be reloaded again so put the lever down once more. The turret is once again attacked by grublins that need to be killed. Then, when they are all gone, another siege tower will appear on the other side than the other one. Go and destroy this exactly as the same as the last one. A cutscene will play and now two more siege towers will appear, in the location of both the previous towers. Use a combination of attacking the towers, repairing the catapult and reloading for the mole and eventually the towers will explode and the enemies stop appearing for now. 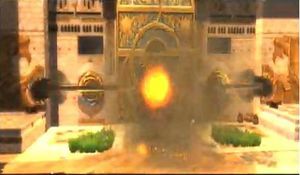 A cutscene will show Malefor's army attempting to breach through the main gate. Before going to assist Hunter and the moles in closing it there are some collectibles to picked up. Go right along the wall to find a spirit gem, then keep going to the area where the right siege tower was for a green crystal upgrade. Keep going to find a spirit gem at the top of a flight of stairs. Fly back along the wall to the other siege tower area to get a third red crystal upgrade. The two spirit gems can be reached by the vines on the left. Fly down to where the tower was destroyed in the video. There is a staircase lined with golden dragon statues that is broken about halfway down. Jump off it and there will be a save point at the bottom. 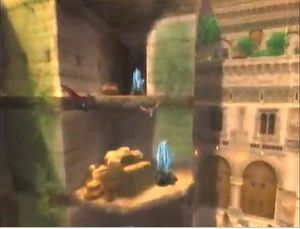 Use the climbing vines at the left corner to reach the two platforms above that each hold a spirit gem on them. Get them both and then jump back down to the save point. Head into the darkened alcove to collect another spirit gem and an armour chest. This holds Spyro's offensive tail piece, which increases damage from melee attacks. Go back out the alcove and climb the vines opposite the save point. These lead to a high platform. Turn around a fly to only platform you can see from here and use the climbing zone to reach the top of the wall. This leads the dragons to just above the battle for the gate. The gate is closed by lighting the fires under the holes and waiting for them to meet in the middle. This section contains your first encounter with a troll. These guys are big and strong and can deal out a lot of damage. For now however, ignore him and go up the ramp to your left where the troll cannot reach you. Send Cynder under the shadow door to find the final spirit gem on this level. Now go back and fight the troll. Use the roll to dodge most of its attacks as they are slow and have a large build up to act as a warning. Attack using breath as it is more powerful than the melee combos. Once the troll is dead more enemies will burst through the gate. Kill some of them and then open the chest in the middle of this area that appears after the troll. It holds Cynders fury helmet, which increases the chance to combo. Next, fly to the side of the gates and light the braziers either side. These will slowly fill up a glowing bar across the gates that lead the orb in the centre. When the orb is filled the gate will be closed. Shut the gate and then kill the rest of the enemies. When there are no enemies on your side of the gate more will try to break in, go up to the gate and push it shut. Keep the enemies out of the square and the gate will quickly be sealed and the level will be complete. This page was last edited on 3 January 2010, at 00:30. This page has been accessed 25,636 times.